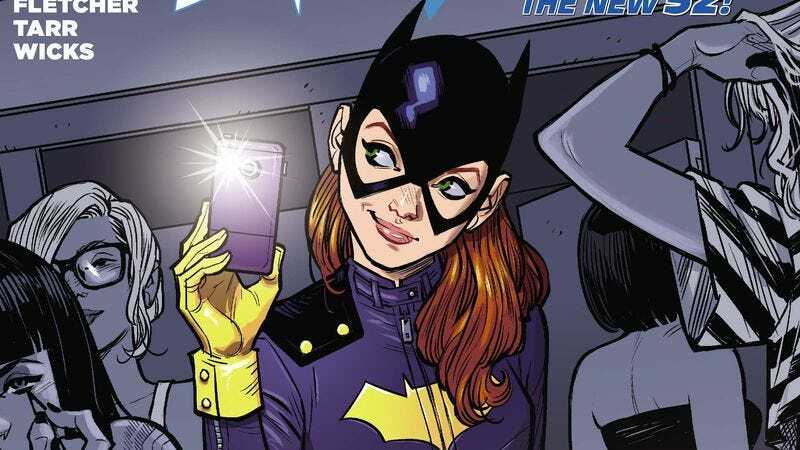 When DC Comics announced a new direction for Batgirl this past summer, the news was met with overwhelming positivity. The sleek costume redesign by co-writer and breakdown artist Cameron Stewart has taken the fan community by storm, and anticipation grows with every new detail about the new team’s first issue. The wait is finally over next week, and this preview of Batgirl #35 shows that readers have good reason to be excited thanks to a strong stylistic shift that invigorates the series. The first order of business by co-writers Stewart and Brenden Fletcher is to get Barbara out of her old surroundings by relocating her to Burnside, the “cool” part of Gotham. The art team brings a lot of personality to the new characters and setting, and the combination of Stewart’s expressive breakdowns, Babs Tarr’s smooth finished artwork, and Maris Wicks’ bright color palette makes the new Batgirl stand out from the rest of DC’s Bat-line. The story is a drastic change from what Barbara has experienced thus far in the New 52, taking a grounded approach that makes the character feel like a real contemporary twenty-something. She needs friends to help her move, drinks too much at parties, hooks up with random guys, gets hangovers, and isn’t financially stable, but unlike most people her age, Barbara will drop whatever she’s doing to fight crime. This preview reveals how the creative team plans to balance Barbara’s domestic drama with her superhero work, and if the entire issue has this kind of energy, DC has a real winner on its hands.